Vartuhi stares at Angel’s portrait, sinking her look into the marks time has imprinted on that face. Sixty-five years of silence scatter against the humanity of the most spontaneous brotherly thought: “God bless her, her eyes are still the same”. The woman lays the picture on the table without losing site of her and, turning to her husband who is observing from a corner, she invites him: “Look, this is my sister”. Armenia. 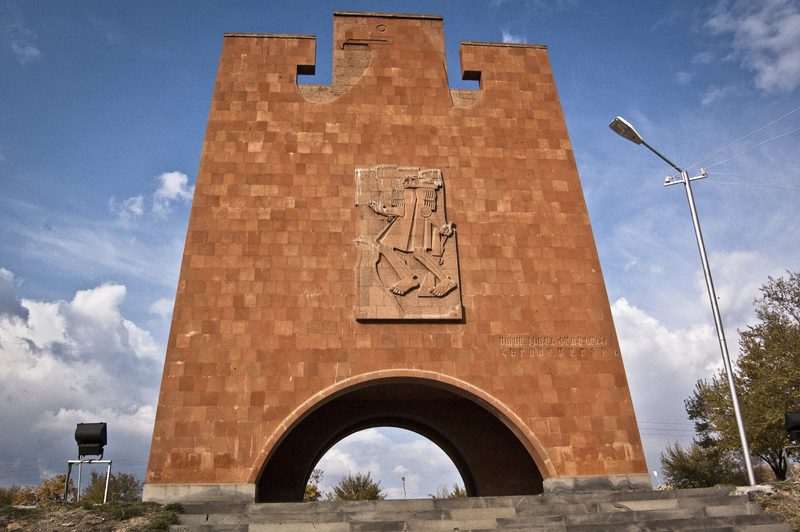 A gigantic red-bricked raptor stands over the highway between the capital Yerevan and the holy city of Echmiadzin. The bus pulls in front of a sign with the name of the village close by. One does not need to speak Armenian to understand what it says: the huge perching hawk is the symbol of the Musa Dagh combatants, the Armenians who in 1915 opposed the Ottoman troops that were here to deport them. This village and the monument that towers above it represent the historical continuity of that human community: escaped a first time to Egypt in 1915, returned home in 1919, transferred to Lebanon in 1939, partially repatriated to Soviet Armenia in 1946. The bus starts again, leaving the place to the whistling of the wind: I open my backpack, take out the portrait I have had with me since leaving Lebanon and enter the dirt roads lined up with low houses. “Angel is ten years older than me; she already had a son, when our parents decided to leave Lebanon to come here to Armenia. We split: we were the first to leave, while Angel stayed in Anjar, waiting for our signal. I was nine”. Vartuhi’s calloused hands do not let go of Angel’s picture. She has not seen her sister since 1946. All her life, Vartuhi has never been anything other than a farmer in this village, a citizen of the poorest state in the Caucasus. “But that signal was never sent. Our father forbade Angel and her family to join us. Here we found hunger, cold and the ghost of Siberia”. Before leaving the village, I go into the belly of the raptor, where a small museum gathers heirlooms, documents, memories of the Musa Dagh refugees. The plywood shrine glorifies the sacrifice of the ancestors, trying to turn a scar of the past into a historical challenge to pass on through the exiled generations. A pre-printed tag tells the story of the migration of Sarkis Penenian and family, who have remained in history thanks to the now yellow boarding pass on the Pobeda. “Family traveling with person in charge: five. Port of departure: Beirut. Port of arrival: Batumi. Issued in Beirut, 19 September 1946. Signed: the Committee for the repatriation of the Armenians of Lebanon and Syria”. Price: 50 Lebanese Liras. A one-way trip to the unknown was somewhat cheap. What does the destiny of refugees depend on? On the ship they board or miss, on the advice they follow or ignore. The Palestinian refugee camp where I live is in Beirut simply because in 1948 the refugees were able to escape on a train that ran between Palestine and Lebanon right before the tunnel on the tracks between the two Countries was blown up. And so it is that Vartuhi and Angel, the Armenian sisters divided only by a short trip on a ship in 1946, have gone through a whole century without ever meeting again. The diaspora is the land of circumstances. The only homeland of the refugees is memory, and war is their true mother. The fog trapping Yerevan dissolves on the first flights of stairs leading up to Tsitsernakaberd, the Armenian genocide memorial. Up here, Armenia and diaspora blend, symbolically re-establishing the unity of the two souls of the Armenian people. A flame on the top of the hill is there to remind of the million and a half victims, while down below, the capital is covered by a white carpet of silence and low clouds. ‘Diaspora and genocide are two sides of the same coin. One issue leads to the other’. Hayk Demoyan, director of the memorial, is waiting for me in the hall’s half-light, where pictures and documents reconstruct the steps of the tragedy that hit the Armenian people a century ago. ‘Acknowledging the genocide is the necessary step to show understanding for the history of the diaspora’. Turkish State politics denies the genocidal purposes of the massacres and deportations carried out by the Ottoman empire against the Armenians, undermining the chances of normalizing relations between the two Countries. ‘In 2009, we were a step away from reaching an agreement but, as of today, the signing of the protocols has led to nothing’. The agreements referred to by Demoyan provided for the re-opening of the Armenian-Turkish border, closed since 1993, reducing the isolation of the small Caucasian State. Indeed, along with the issue of the Western border, Yerevan is faced with a 20-year-long conflict on the Nagorno – Karabakh with the Eastern neighbor, Azerbaijan. ‘Times are not ripe, yet, but time is in our favor. In just a few years we will be able to gather the fruits of our politics of openness’. From the hall’s picture windows, Mount Ararat, a symbol of the Armenian saga, fills the sky as the haze makes room for a cold and clear color. The white giant lays over the border, on Turkish soil, entrusted by history to the sovereignty of the obtrusive neighbor. “But Armenia does not have land claims, we have stated it over and over in all international venues’. After a year spent with the Lebanese diaspora, Demoyan’s approach to relations with Turkey may sound very pragmatic, far from the fierce rhetoric and dreams of revenge spreading in the Armenian quarters of Beirut. ‘The diaspora has paid the highest price of the Ottoman genocidal madness. That is why it has internalized an emotional approach. As citizens of this Country, though, we also have to adopt a realistic approach’. The brief appearance of the sun winds up behind the Ararat curtain, leaving the alleys of Yerevan to the long autumn night. The old town of the Armenian capital has been the stage of a desolate show since the ‘90s: the overseas diaspora, strong with its economic power and anxious to mark the land, invades every inch with reinforced concrete. Lines of deserted apartments, deserted store windows, summer residences, solitary private police agents in the corners of the night: the legacy of the laissez faire politics the Armenian government reserves to its diaspora. The ruthless stretch of concrete holds the same punishment the Lebanese diaspora inflicts on its Beirut. The barbed wire breaks the absolute continuity of the plateau. An ant runs over a segment of the zinc-coated weave, until a gust of wind blows it to the ground. Beyond the barbed wires, Mount Ararat attacks the horizon, close as only the things that cannot be touched seem. This is the limes from which Turks and Armenians have been screaming at each other for a century: 'Hic sunt leones'. These are the Pillars of Hercules that hold the last standing stretch of the Iron Curtain. The ant, unaware, zigzags for long between the two Countries, before disappearing in the loneliness of the prairie. What if, instead of flying to Beirut, I went by land?